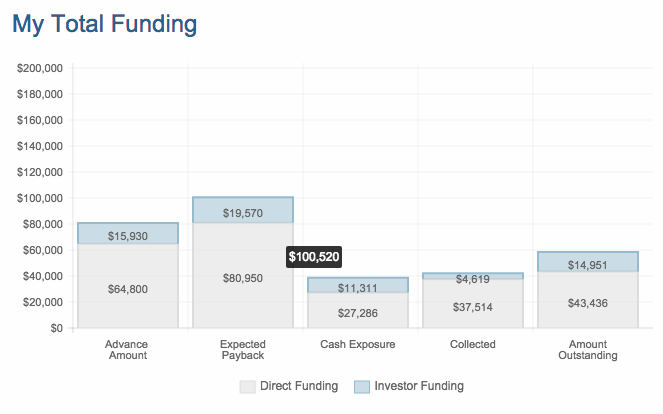 What is the My Total Funding dashboard? The "My Total Funding" dashboard combines the "Direct Funding" (All) and "Investor Funding" dashboards to allow clients who are Direct Merchant Cash Advance Funders and Brokers/ISO's who participate as syndicators with other Funders, to view their entire investment portfolio on one dashboard. To see view consolidated totals for each metric, mouse over the corresponding bar in the graph. 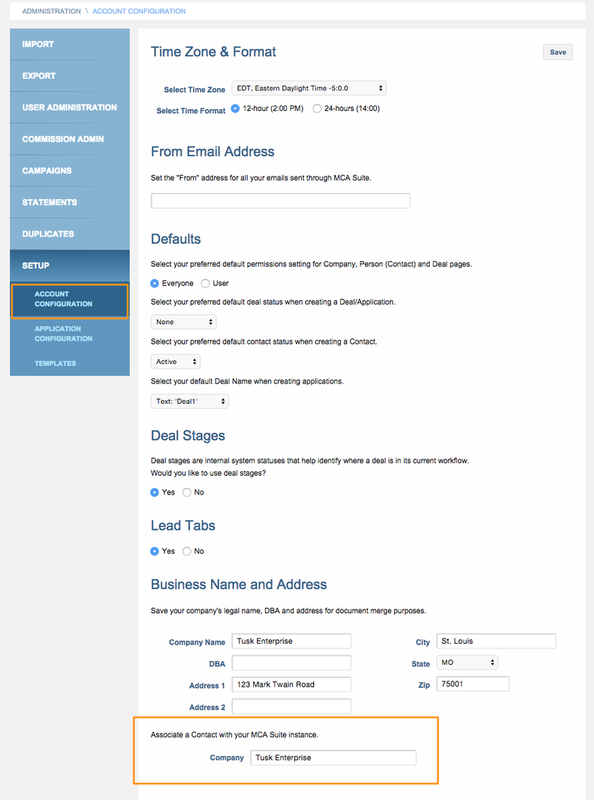 The Direct Funding information on the "My Total Funding" Dashboard takes the Contact associated with the MCA Suite instance as a reference to create the dashboard. In the example above, Tusk Enterprise is the owner of the MCA Suite instance (see below for example of how to associate a contact record in MCA Suite with your MCA Suite instance). 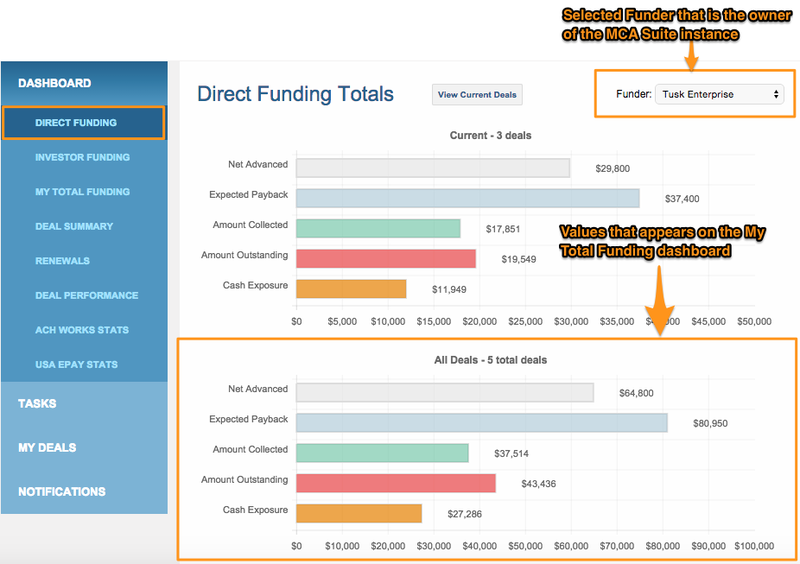 The "My Total Funding" dashboard's "Direct Funding" values come from the "Direct Funding Totals" dashboard for the selected Funder associated with the MCA Suite instance. In this case, that selected Funder is Tusk Enterprise. 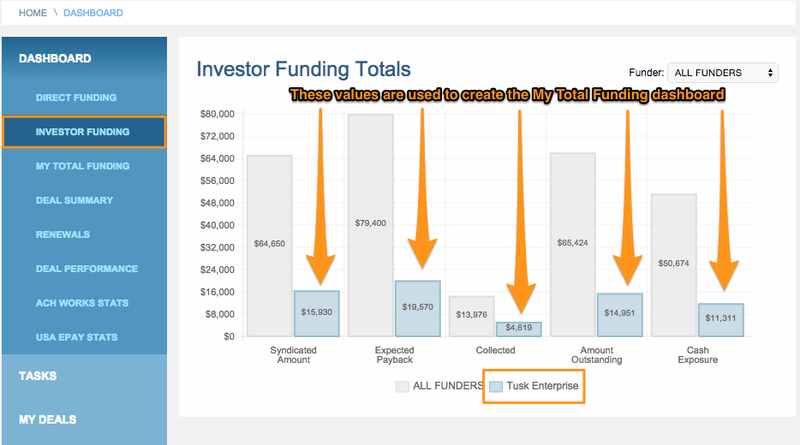 Since a Contact has been associated with the MCA Suite instance (Tusk Enterprise), all the values from the Investor Funding dashboard will be added to the "My Funding Total" dashboard. Click on the following links to Direct Funding Dashboard and Investor Funding Dashboard to find out how information are populated on those dashboards.